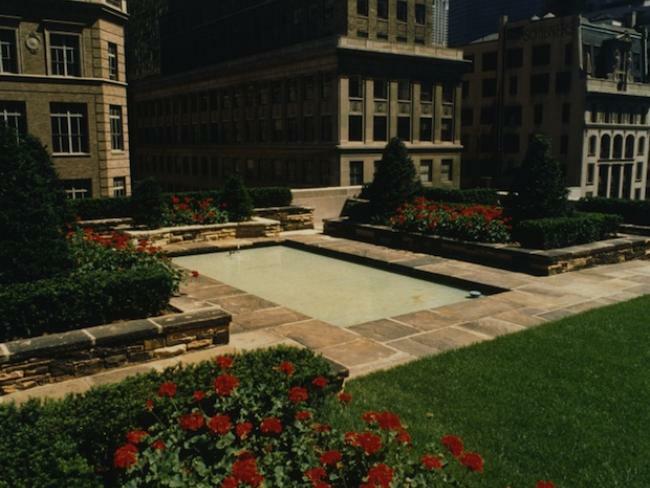 As far back as the 1930s, New Yorkers were creative about maximizing their outdoor spaces. Outdoor sanctuaries like rooftops and decks were seen—just as they are today—as an opportunity for nature-starved city slickers to savor some greenery. This would be Hancock’s most ambitious project to date, occupying his time between 1933 and 1935. Hancock called his materpiece “The Gardens of the Nations,” taking inspiration from the styles of gardens in a number of different countries, including Holland, France, Japan, Italy and Spain. Native plants, a Zen garden, topiary, fountains, sculpture, stone walls and a winding rock garden were all part of the plan. An enormous amount of effort went into constructing these striking landscapes. All of the materials—3,000 tons of earth, 500 tons of brick, 20,000 tulip bulbs and 2,000 trees and shrubs—had to be lifted up 11 stories via the service elevator or simply straight up the side of the building with a block and tackle. A garden of this magnitude also required significant amounts of water: 96,000 gallons a day were lifted by electric pump to the rooftop. Over 400 people attended the opening day on April 15, 1935, including prominent horticulturists, the guest of honor Nelson Rockefeller and ambassadors from each of the countries represented in the gardens. The next day, a fundraiser for Bryn Mawr College brought 2,000 people to the garden; many of the students dressed in costumes from the countries represented. Despite attracting 87,000 visitors in its first seven months (the entry fee started out at one dollar and soon went down to 40 cents) the Gardens of the Nations never became profitable, and it closed to the public in 1938. Over the decades, the gardens evolved and eventually disappeared—some of the roof space is now occupied by machinery, though a bit of the garden's original design might still be visible to high-floor tenants of 30 Rock and its surrounding buildings. For more photos and details on these long-gone gorgeous gardens, check out this recent blog post on Retronaut, and this 1936 newsreel of Radio City dancers performing ballet in the English Garden.